At 36, many thought that Alberto Entrerrios' transfer from Madrid to Nantes last summer meant the end of his career, far from it. He's been drafted back into the Spanish national team and he's likely to take part in the World Championship in January, thanks to his very good start to the season with his new team. eurohandball.com talked to the Spanish legend about his new team, his expectations with his club and the selection, three days before the return match in Lisbon in the EHF Cup. eurohandball.com: You have integrated very quickly in the Nantes club. Everything went really fast. Alberto Entrerrios: That's true, it all went really quickly and really well. It's really a good experience for me, and for my family also. I'm especially happy for my kids because everything is going smoothly, including at schools. Moreover, people are always willing to help here, be it at the club or elsewhere. It's been a good surprise. eurohandball.com: After this few months in the LNH (French league), what's your opinion on the league? Alberto Entrerrios: The level is very high, which doesn't surprise me. I expected it, since I knew a lot of players before coming here! There are two or three surprising teams here and there, but the teams at the top of the league are all very close to each other. eurohandball.com: Which players have impressed you so far? Alberto Entrerrios: It's not a surprise but Mikkel Hansen is really strong. He's one of these few players that can make a difference on his own. There is also Thimothey Nguessan, from Chambéry, who has got great potential, and he's still so young, he's got everything to become a great player. eurohandball.com: How would you describe Nantes' team's strengths? Alberto Entrerrios: I think that what makes us strong is that we're all a part in building this team. The squad is very well balanced, handball-wise or generation-wise. The older players, like me, and the younger live in good harmony, because we all have the same fighting temperament. We're a squad with a lot of character. eurohandball.com: And you needed some to defeat Benfica Lisbon last Sunday. Alberto Entrerrios: The club is still very young, especially in the European circuit. It's quite a good thing to begin at home against such a team. Even if they had no real superstar, Benfica caused us a lot of problems. But what has amazed me most is the interest related to this game, the fact that the arena was sold out and that the fans gathered en masse to support us. 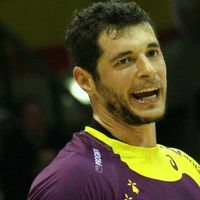 eurohandball.com: The Nantes team has four weeks ahead of it which will be hard to handle, with four different competitions. What will be the essential factors there? Alberto Entrerrios: The first thing is that we are going to have to be really careful about the recovery after the games, physically and mentally. Staying strong physically is not going to be enough. The main problem will be the focus. That's what is really important, in game or in everyday life, the small details, individual and collective. That's how we will climb step after step. eurohandball.com: Your coach Thierry Anti clearly said that the League Cup was this year's main goal. When one's got a handball history such as yours, how do you face this kind of challenge? Alberto Entrerrios: With a huge appetite. It would so important for the team and for the club. When I was in Leon, we hadn't won anything, and then we won the Asobal Cup. That was the same situation as the one we have in Nantes at the moment. The first title, it's such a euphoria, it's fantastic. You must let yourself be carried by the envy to the title. It's as simple as that. eurohandball.com: How was your come back with the Spanish national team? Alberto Entrerrios: When I learnt I wasn't drafted for the Olympics, I really thought I wouldn't wear the Spanish jersey ever again. So playing again with it is a huge satisfaction. But I don't lie to myself: if I wasn't comeing back, at 36, to have this last challenge, it would definitely be over for me with the Roja. It was a nice surprise, since I shared it with my club mates (Valero Rivera and Jorge Maqueda). It's a special situation: I go away from Spain, I'm not drafted for the Olympics, and then in the end, I find myself with all these new challenges to face. Alberto Entrerrios: A last big competition, and even more so at home. It's an amazing opportunity for me, for the team. I realise the chance I've got, at my age, to have the honour to experience all of this.